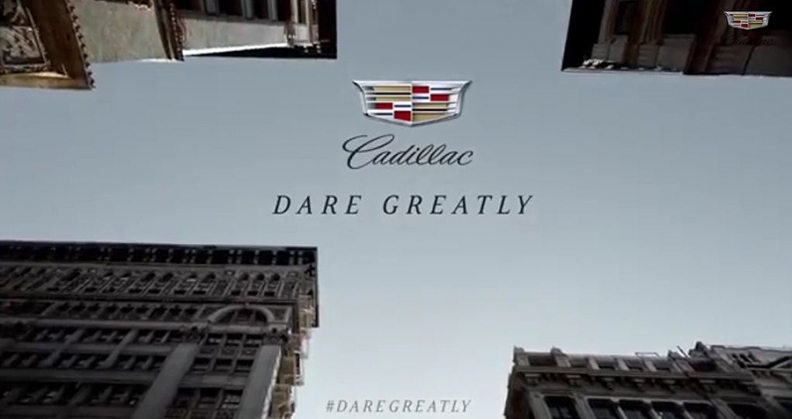 DETROIT -- Cadillac will introduce its new advertising direction during the Oscars broadcast Sunday with a contemplative commercial that quotes from a Teddy Roosevelt speech, anchored by the tag line "Dare Greatly." The commercial posted by Cadillac on YouTube this week doesn’t show a Cadillac vehicle -- others planned for Sunday will -- and splices together mostly black-and-white snippets of New York street scenes. The entire voiceover is from a speech given by Roosevelt in Paris in 1910. A Cadillac spokesman said two longer commercials will air during the Oscars and will feature Cadillac vehicles. The commercials, made by advertising firm Publicis Worldwide, kick off what Cadillac marketing chief Uwe Ellinghaus last month called “a brand campaign about Cadillac's point of view,” which he said has been lacking for many years. "I'm very keen on finding something that encapsulates the sprit of Cadillac in just a very short phrase that hopefully lasts as long as ‘The Ultimate Driving Machine’ for BMW," he told Automotive News. Ellinghaus, who held top marketing posts at BMW and luxury pen maker Montblanc before coming to General Motors, said the work represented "a very quick turnaround" by Publicis, which was hired as Cadillac's main agency in December. He said Cadillac was drawn to the agency in part because of its success in "rejuvenating traditional luxury brands for a more contemporary appeal," including jewelry and watch maker Cartier. The campaign is timed in advance of the March 31 unveiling of the CT6 large sedan on the eve of the New York auto show and comes as Cadillac begins moving its sales and marketing headquarters to Manhattan. Last year, Cadillac's U.S. sales declined 6.5 percent in a market that rose 11 percent. In January, its U.S. sales were up 2.6 percent, largely due to Escalade sales.